Fibre does so much more than just keep you regular. It can help lower cholesterol, keep blood sugar stable and make it easier to lose weight. There are two types of fibre - soluble and insoluble. Soluble fibre absorbs water while insoluble fibre does not. They both serve different functions in the body. Active Fibre Complex is a delicious apple flavoured powder mix. Just add to a glass of water or mix it in with your favourite shake mix. Lowers Cholesterol - soluble fibre attaches itself to cholesterol particles & takes them out of the body. Normalise Blood Sugar - because soluble fibre isn't absorbed it doesn't contribute to blood sugar spikes. Weight Control - soluble fibre helps you to feel full and so can stave off hunger. Healthy Bowel Movements - soluble fibre absorbs water and bulks up your stools for healthy elimination. Hunger Control - like soluble fibre, this type of fibre can assist with weight control by staving off hunger pangs. Digestive Health - insoluble fibre does help to keep you regular. 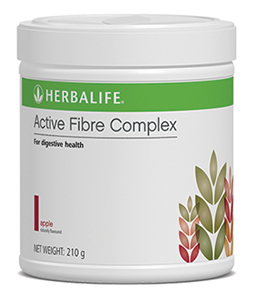 Herbalife's Active Fibre Complex is an excellent source of soluble and insoluble dietary fibre. It has a pleasant apple flavour and each serving provides 5g of the recommended 25g (for women) and 30g (for men) of daily intake of fibre. Can be taken in water or added to your favourite shake or tea. Take 1-2 times daily. Sugarcane Fibre, Maize Dextrin, Soy Fibre, Inulin, Natural Apple Flavour, Citric Acid, Citrus Fibre, Sodium Carboxymethylcellulose, Maltodextrin, Cellulose, Sucralose, Silicone Dioxide, Caramel (Colour) and Beet Juice (Colour). **Vitamins can only be of assistance if the dietary vitamin intake is inadequate.